The Total Garage is Idaho’s #1 solution in transforming your garage into a functional space or a well deserved oasis! 1. We offer a COMPLETE solution for finishing your garage! As our name implies and what sets us apart from other companies, we can completely finish your garage with sheet rock, texture, paint, and more. What ever your garage and home improvement needs, we can do it. Additionally, we are pleased to carry a variety of quality garage organizational products from our nation’s finest manufacturers. 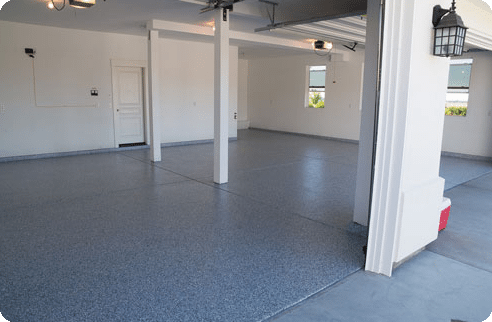 We provide custom garage floor coating systems, locally constructed custom cabinets, and space saving organizers. These organizational systems are also well suited for interior use including basements, laundry rooms, utility rooms, or wherever your need may be. 2. We help you add more SPACE, FUNCTION and STYLE to your home! The garage is finally getting a second look, as home owners demand more space, function and style in their homes. According to the National Association of Home Builders, close to two-thirds of all new homes have two-car garages, and nationwide, 19 percent have three-car or more garages, especially in areas where houses traditionally do not have basements. But even though garages are growing in size and are often the largest room in the house, they usually are one of the last areas homeowners address when organizing their homes. 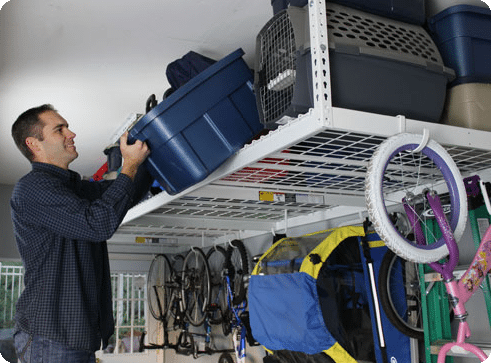 Garage storage and organizational systems are among the fastest growing segments of the home-improvement market, and with a little help, your garage can be transformed from a cluttered mess into a clean, usable space. Furthermore, if you are in the process of selling your home, a tidy, well organized, multi-purpose garage can become an attractive selling point. On top of that, some say that improvements in this room may actually increase a homes value as well as decrease the time it takes to sell. 3. We have the right solution for YOU! Conquer the clutter in your garage TODAY! 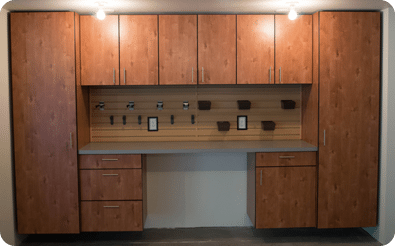 The Total Garage is committed to taking your garage and transforming it into a usable space that meets your specific needs, taste, and function. Whether you want a garage that is flashy and over the top, or one that is simple and classic, we have the right solutions for you! Why keep your #2 asset(s) in the driveway in the weather and sun, and keep your hardly used stuff in the garage? The Total Garage has the right solution that will allow you to bring your car back into the protection of the garage and bring organization to the rest. Your finished garage will be something you will be proud of and excited to show off to your friends and neighbors! What will YOUR Dream Garage look like? Schedule a FREE Design Consultation!